Nuovo! New! Renewed and improved! The spring of the carillon boom-time has begun again. A new carillonneur, a new museum, a new appointment, a new instrument, new music and a new competition. Wake up campanologists of the earth. The Netherlands Carillon Center also has something new to offer. The webshop has been renewed - the sheet music can now also be obtained digitally - and last but not least: Dutch Carillon News has been able to interest Hylke Banning for the editorial board. Along with Gerda Peters he will take care of the compilation of this digital newsletter. I'll say it again: this newsletter is being sent to over 1,000 addresses around the world. That completes this promotional message. 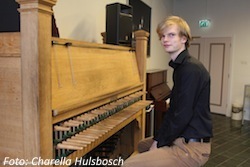 AMERSFOORT - On Tuesday, June 27th, Bob van der Linde, a student at HKU Netherlands Carillon School, will play an exam concert on the Eijsbouts carillon of the Amersfoort Onze-Lieve-Vrouwetoren. His performance will be judged by carillon teachers and a delegation of the HKU Utrechts Conservatorium. The time of the exam and the program will be posted on our website, on Twitter and on Facebook. ZUTPHEN – The Clockhuys museum was opened in the Wijnhuistoren on Thursday February 23, 2017 with the carillon of this characteristic tower at its heart. It is absolutely in keeping that campanology is the main theme in the Wijnhuistoren. The brothers François and Pieter Hemony poured the bells of their first carillon for this tower in 1664. Unfortunately, this instrument was largely lost in 1920 due to a fire in the tower. Of the 32 Hemony bells seven survived the disaster. Only one of them is still part of the current carillon. During the opening of the museum, Ada Boerma-Van Doorne, chairman of the Dutch Carillonneurs Association (NKV) addressed the attendees. On behalf of the NKV she presented the so-called Van der Elst bell to the museum. This bell, being the perpetual trophy for the improvisation competition organised by the NKV, was cast in 1963 and is named after Dr. Wijnandus van der Elst, chairman of the NKV from 1949 to 1955. It is not only figuratively but also literally a prodigious prize and therefore not easy to move. That is why the winners these days receive a scale replica, including a matching wooden bell frame. The new exhibition space covers two floors in the tower. Visitors can play on a practise carillon keyboard and watch a special seven-minute movie about the carillon. ALMERE – Bauke Reitsma has been appointed town carillonneur of Almere-Stad and Almere-Haven and will be playing on a weekly basis in good cooperation with his colleague Gerda Peters who also provides weekly concerts on both instruments. Bauke is already carillonneur of Bunschoten, Baarn and Weesp. 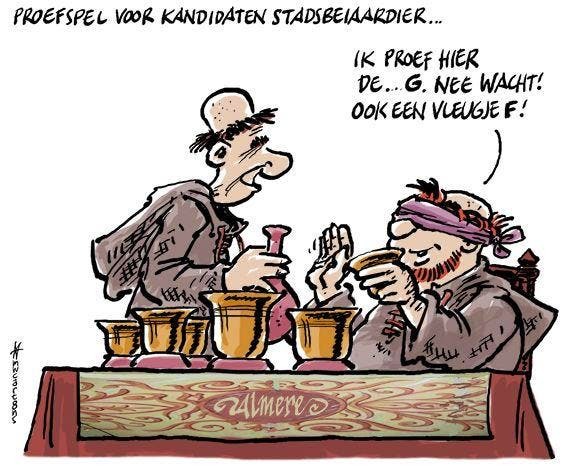 Fourteen candidates responded to an advertisement from the municipality of Almere. Only two were eventually invited for an audition on the carillon of the Goede Redetoren. The Almere Carillon Foundation while not directly involved in the selection process greatly appreciated that the municipality had invited not only musicians but also representatives of shopkeepers to take part in the selection. Apparently even residents could give their opinion, without risk of course to the impartiality of the proceedings. In any case, the selection committee completed their task promptly on the same afternoon. Bauke is also active as organist, pianist and conductor in addition to carillonneur. He is also secretary of the board of Netherlands Carillon Center. 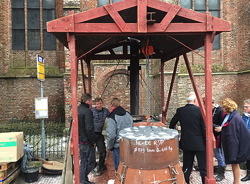 DE RIJP – On Saturday April 1, 2017, the first bell for the new carillon of De Rijp's Grote Kerk (Noord-Holland) was cast that took place in the open air near the church. To make this possible, the bell-founder Simon Laudy had built a furnace on the spot. One day later, this first and largest bell could be broken out of the mould. 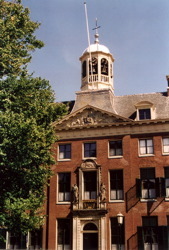 The bell is a gift from the municipality of Alkmaar and it bears the coat of arms of Alkmaar. The Carillon Foundation De Rijp has been working for more than three years to prepare for this new carillon, which will include 47 bells. The cost of casting and installing the new instrument amounts to a total of € 215,000.-. This project also provides safer access to the tower and makes some adjustments to the swinging bells. In addition, the historic tower structure is being restored. To enable the financing, various funds and companies have been enrolled and support has been promised by the municipality. Prior to the casting, there were speeches by Chairman Fred Hoek and Secretary Fré Harmsen of the foundation. On behalf of the city, councillor Anjo van de Ven was present. She started the casting of the bell at 21:30, after which bell-founder Simon Laudy took over. Particularly interesting was the speech by Alkmaar's city carillonneur Christiaan Winter, who explained the emergence of carillon culture in the Low Countries to the numerous public in the Grote Kerk. He will be the regular carillonneur of the instrument when it is commissioned in December 2017. 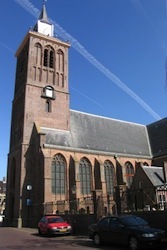 The tower of the Grote Kerk had previously housed a carillon. However, the bells were lost during a massive fire in 1654 that began in a hemp mill. Most of the village burned down and only the church from 1529 and the town hall from 1630 remained. 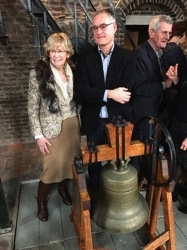 When in 2014 the municipalities of Schermer, Graft-De Rijp and Alkmaar merged, Christiaan Winter suggested placing a new carillon in the Grote Kerk at De Rijp. LEEUWARDEN – In 2018, Leeuwarden is the European Capital of Culture. Within this framework, many cultural activities are being organised in the Friesian capital and the surrounding area. The carillon in the dome of the City Hall of Leeuwarden is however no longer regularly played because of budget cuts since 2010. In order to make this historic instrument sound again in 2018, the management board of the Sint Anthony Gasthuis is looking for a carillonneur. The assignment will be to play the 39 bells in mid-tone tuning. 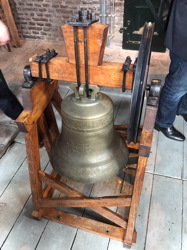 Thirty-one of these were cast by Claude Fremy in 1686.
if possible, to coordinate with HKU Netherlands Carillon School on the involvement of carillon students in the recitals. The carillonneur must be qualified in accordance with the NKV's standard provisions. Remuneration will be in accordance with these provisions although no permanent employment will be entered into. The carillon will be made available in a technically good condition and any necessary maintenance will be arranged as required. Candidates can apply by supplying relevant information in an email to the chairman of the board of St. Anthony Gasthuis, Mr. H. Bosch: bosch@sintanthoon.nl. The application deadline is May 22, 2017. Candidates will then be short-listed by the management board, in consultation with the municipality of Leeuwarden. They will be invited to an audition that will be assessed by a committee of experts. Based on the advice of the committee, a carillonneur will be chosen in consultation with the municipality. DEN HAAG / UTRECHT - On Wednesday 5 and Friday 7 April two presentation concerts took place as part of a special cooperation project between the composition class of the Royal Conservatoire in The Hague, The Hague city carillonneur Gijsbert Kok and the Utrecht city carillonneur Malgosia Fiebig. Six students from different countries each wrote a new work. In this way young composers come into contact with the carillon and new carillon repertoire is created. The concerts were given as part of the Spring Festival of the Royal Conservatoire and performed on the carillon of the Grote Kerk in The Hague and the Dom Tower in Utrecht. The compositions are expected to appear in print soon. 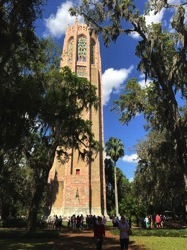 LAKE WALES - From 4 to 12 March, the International Carillon Festival took place in the Bok Tower Gardens in Lake Wales (Florida, USA) for the 23rd time. This is one of the most beautiful places in the world to enjoy carillon playing in peaceful and quiet surroundings. The construction of the 100 hectares of gardens and the construction of the tower with the beautiful Taylor carillon began in 1921 on the instructions of the Dutch emigrant Edward. W. Bok. He wanted to create "a place of beauty unmatched in the country", which has undoubtedly succeeded. During the festival, concerts were given by Geert D'hollander (regular carillonneur of the Bok tower), Frans Haagen, Koen Cosaert, Lisa Lonie (also with Janet Tebbel) and Ellen Dickinson. SPRINGFIELD - On 2nd and 3rd June, the Thomas Rees International Carillon Competition will take place for the first time in Springfield IL. (USA). A broad and varied program is requested from the candidates. The organisation of the competition is in the hands of the North American Carillon School (NACS). Based on sound recordings from the various entries, five candidates have been selected for the final in Springfield. Those from the Netherlands include Rien Donkersloot (former student of HKU Netherlands Carillon School) and Bob van der Linde (student of HKU Netherlands Carillon School). The next Dutch Carillon News will appear at the beginning of June. Please submit copy (maximum 250 words) for this issue before June 1st to redactie@beiaardcentrum.com.